Outdoor swimming goggles help protect your eyes. While many competitive swimmers spend their time training and competing indoors, there are some who enjoy swimming outdoors as well, whether it’s just for training or they are part of a summer swim team that competes in outdoor pools. Regardless of the situation, you’ll need outdoor swimming goggles, such as the Speedo Vanquisher 2.0 Mirrored Goggles. These are the best swimming goggle for blocking the sun and providing the visibility you need while protecting your eyes. The first step is to choose the right outdoor swimming goggles to meet your needs. Once you decide on the style and brand you want, make sure the goggles you choose fit properly. This often involves trying them on in-person. First, press one side of the goggles onto your face to make sure it sticks well. In addition, put the goggles on to ensure they offer a comfortable fit. 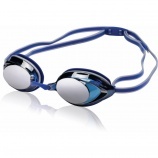 Remember, you’ll be wearing these goggles for many hours and need to feel comfortable in order to perform your best. Once you determine the best swimming goggle for blocking the sun, it’s up to you to take good care of them to ensure they last for as long as possible. Good outdoor swimming goggles may seem expensive, but if you care for them properly, they will last a long time. Be sure to rinse your goggles thoroughly after each practice or swim meet to help remove the chlorine and prevent the breakdown of the materials. In addition, you should invest in a quality goggle cleaner that will help resist fog and keep your goggles clean. Finally, purchase a goggle case to protect your swim goggles when you’re not using them. You should never place your goggles directly into your swim bag to prevent tangling, scratching and other damage. Choosing the right outdoor swimming goggles is important if you’ll be spending time in an outdoor pool. One of your best options to keep the sun out of your eyes and provide the visibility you need is the Speedo Vanquisher 2.0 Mirrored Goggles. These goggles offer optimal comfort and allow you to enjoy your swim, whether you’re training for your next big race or you’re currently competing. If you’re looking for the best swimming goggle for blocking the sun, contact us. We carry a vast selection of outdoor swimming goggles so you can find the perfect option for you.